Details relating to the Italian Commemorative of 2018. 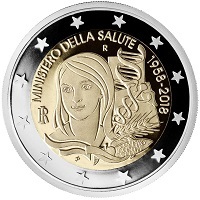 This coin commemorates the 60th Anniversary of the establishment of the Italian Ministry of Health. In the inner circle, health is represented by the image of an attractive young woman. Around the edge of the inner circle from around nine o’clock to three o’clock is the inscription “MINISTERO DELLA SALUTE 1958 – 2018”. Variuos symbols connected with health are shown to the right of the young woman – a representation of a DNA strand, two snakes winding around a rod (Caduseus). Also shown are an ear of wheat and a fish. The country is shown by an I superimposed on an R – at eight o’clock. The mint mark appears at twelve o’clock and the initials of the designer beneath the young woman at seven o’clock. An interesting feature is that the twelve stars of the EU, shown in the outer ring have been rotated 15° from the normal representation so that at top and bottom (twelve and six o’clock) there is a gap where normally there would be a star. Return from Italian Commemorative 2018 to euro coin collector.